ANSI Y type Strainers are typically used in applications where the amount of solids to be removed is small, and where frequent clean-out is not required. They are most often installed in gaseous services such as steam, air, nitrogen, natural gas, etc. The compact, cylindrical shape of the Y type strainer is very strong and can readily accommodate the high pressures that are common in this type of service. Pressures up to 6000 psi are not unusual. When steam is being handled, high temperature can be an additional complicating factor. A steam pressure of 1500 psi will often be found at temperatures of 1000°F. Basket type strainer is essentially a screen installed to allow liquids to pass through,but not larger items,The larger items fall to the bottom or are held in a basket for later clean out. 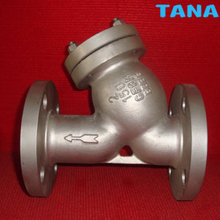 TANA offers a wide range of strainers in types of Y Strainer.T strainers& Basket strainer etc. A Strainer is a type of sieve typically associated with separating liquids from Solids In general, a sieve separates wanted/desired elements from unwanted material using a tool such as a mesh,net or other filtration or distillation methods,but it is also used for classification of powders by particle size, or for size measurement as an analytical technique.Strainers arrest pipeline debts such as scale,rust,jointing compound and weld metal in pipelines,protecting equipment and processes,This turotial considers the range of strainer and filter types in use and how to size and select them for different applications. 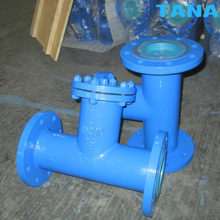 T strainer is widely used in pipelines such as steam, air, water, oil and other media. 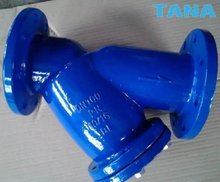 It protects all kinds of equipment on pipeline system, such as pumps, valves, etc., and prevents pipes from blockage and damage from rust and slag. 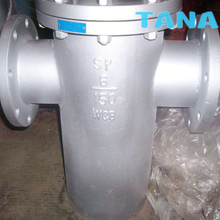 T strainer has strong anti fouling performance, convenient pollution discharge, circulation area, small pressure loss, simple structure, small size and other characteristics; the filter screen material of T type filter is stainless steel, strong corrosion resistance, long service life; T strainer is divided into DC and baffled the filter, the density of 10 mesh 120 mesh, temperature is 0~450 DEG C, according to user’s needs. 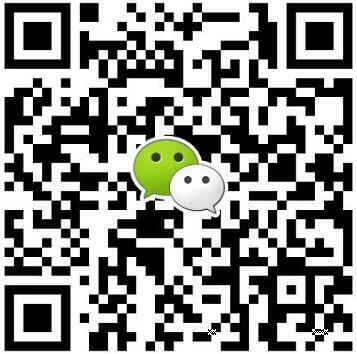 Wenzhou Topnotch Machine Co.,Ltd is a professional leader China Y type strainer,DIN F1 Y-Strainer,strainer valve,Y-Strainer,t line strainer manufacturers and suppliers with high quality and low price.Welcome to contact us.